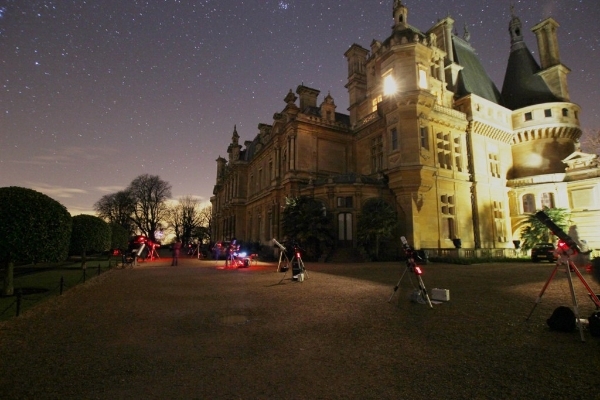 Waddesdon and WAS Stargazing Success! I'm very pleased to report that the Wycombe Astronomical Society Stargazing Event at Waddesdon manor was a huge success! Despite some challenges with the clouds our guests were treated to some lovely night sky views through a comprehensive range of different telescopes and binoculars, as well as a superb pre-gazing lecture from our very own Dr Sandy Giles. The guest's evening started with a meal in Waddeson Manor's superb restaurant, and if our pre-event buffet was anything to go by it would certainly have been very satisfactory! I certainly heard no complaints from either parties. Sandy's lecture followed next and was a strong highlight for me. He managed to capture the excitement of 'real world' astronomy perfectly, and I found his delivery confident, passionate and very inspiring. He deliberately focussed on what can be seen from our own gardens and the type of equipment needed to do so. He covered equipment choices from the modest Dobsonian reflector to the.... well lets just say 'the if you have to ask' refractor level! Chris Rowland's did an excellent job in preparing a list of suitable objects for the evening and it was clear that the WAS members had done their homework! Highlights included Jupiter, Orion Nebula, The Beehive Cluster and many more. In fact you can see the full list by clicking here. With the knowledge imparted by Sandy the guests seemed to really enjoy seeing many of the objects discussed with their own eyes. It was a rewarding experience for the WAS members too and the feed back from the National Trust has been very very positive. Without doubt we are sure this will lead to future events and I for one cant wait! So that leaves me to pass on thanks to all involved. Without the support of the WAS members events like this would not be possible! Jupiter is the biggest planet in our solar system and shows a disk with even the smallest telescope. Better scopes will show two dark cloud bands, with the Great Red Spot on the Southern edge of the southern band. The Great Red Spot will be crossing the visible disk; it will appear in the centre at 21:59 UTC. It should be visible but may not be as obvious as it appears in images. Three of the four bright Galilean moons are visible, Ganymede then Europa to the East and Callisto on the West. The fourth moon, Io, will be hidden behind Jupiter from 20:15 and will emerge from Jupiter’s shadow about 23:39. Jupiter is about 5 times the distance of the Earth from the Sun and orbits the Sun in just under 12 years. It has a mass of 318 times that of the Earth and is about 11 times the diameter. It rotates about its axis in just less than 10 hours, the fastest of the major planets. Castor is the brightest star in the constellation Gemini, telescopes show as a double star. The two visible stars orbit each other in about 467 years. Each of these stars is itself a very close spectroscopic binary star. There is also a faint companion; this companion is an eclipsing binary. This makes a total of six stars. The distance is about 51 light years. Binary stars are important because measurements of their orbit period and speed can give their mass and that, with observations of their spectrum helps with theories of how stars form and develop. This is a binary star in the mane of Leo. The stars may appear to be different colours with the brighter one orange-red and the dimmer one greenish-yellow. They are 100 light years away and the stars orbit each other in about 600 years. This is a visual double star; it is the middle star in the tail of the Big Dipper. Mizar is the brighter star and is visible as a binary star in telescopes. Each of these stars are a spectroscopic binary, Mizar A was the first star to be identified as such. Alcor is also a binary star. This is a five star system below Alnitak, the left most star of Orion’s belt. The primary is a binary that’s a little too close for us to separate with our telescopes and there are four other stars. They were formed 2.5 million years ago as part of a young cluster of stars. The Pleiades is an open cluster of stars, easily visible with the naked eye. The stars we see are the brightest ones of 1000 stars that were formed from a cloud of gas and dust about 100 million years ago. As time passes the stars will go their separate ways and the cluster will dissipate. This is expected to take about 250 million years. The distance to the cluster is 390 to 460 light years and the central region is about 16 light years across. Open clusters such as this are important for astronomy because they give a snapshot of stars of different masses, all at similar distances and of the same age. This is an open cluster of stars in the centre of the constellation Cancer, between Gemini and Leo. It’s visible as a faint grey blob with dark skies. The cluster formed about 600 million years ago and is about 520 to 610 light years away. The centre is about 23 light years across and appears to be about three times the diameter of the Moon. It’s older than the Pleiades so the bright high mass stars have come to the end of their lives and become white dwarfs. This is located to the NW, about half way up the sky. This may be visible over the house. It is two open clusters of stars close together in the Milky Way. They seem to have formed together, about 12.8 million years ago and are both 7500 light years away. These three open clusters in Auriga are all high to the SW. They are 4 to 5 thousand light years away. These are a couple of open clusters fairly low to the South. M46 contains a planetary nebula. This is a huge star forming region, made of a vast cloud of gas and dust. Stars are forming and some of the brighter ones are illuminating the centre of the cluster. These show as the Trapezium. It’s about 1,344 light years away and is visible to the naked eye as a fuzzy blob under the belt of Orion. It is about 24 light years across and 2000 times the mass of the Sun. This is a planetary nebula in Gemini. It is about 3,000 light years away. Visually it shows as a fuzzy star. We think that the Sun will form a similar planetary nebula at the end of its life, in 4 to 5 billion years. This is a globular cluster in Bootes, low to the E. It’s a cluster of about 500,000 stars, 33,900 light years away and 8 billion years old. This is a three degree chain of stars ending with a small open cluster. It is high to the NW. This is located almost overhead in the NE. It’s visible in telescopes as a fuzzy oval. Its centre is a region where large numbers of stars are being formed. A Supernova was discovered in M82 on the 21st January. It may still be visible just to the side of the centre as a tiny star. The galaxy is about 12 million light years away so that’s when the supernova actually happened. M81, Bode’s Nebula is nearby. This is a large spiral galaxy. This is also almost overhead near the tail of the Big Dipper. It is a face on spiral galaxy with a smaller companion. Our small telescopes only show the core of the galaxy but images show the spiral arms. This is currently fairly low in the NW. It may not be visible because the house is in the way. This is the closest large galaxy to us, about 2 million light years away. It’s about 3 degrees across and the centre is visible to the naked eye in dark skies. Telescopes show the central core, you need long exposure images to produce the spectacular images we all expect. What are these M numbers? These objects were first catalogued by Charles Messier and his collaborators in France in 1771. He was searching for comets and made a list of objects that looked like comets but were not. There are a total of 110 Messier objects. Mars and Saturn are morning objects; they will become visible earlier in the evening as the year goes on. Mars will be in opposition in just over a month on the 8th April. A good time to observe Mars will be in April and May. Saturn will be at opposition on the 10th May so will be visible from May to July. Venus is an early Morning object, rising before the Sun. It will be visible throughout the spring and summer. Mercury will be visible in the early evening over the next few weeks, with the best opportunity on the 14th March. It is low to the W and is best seen not long after sunset. It’s difficult to see because it’s so low and in the twilight sky. Take part in National Astronomical week, 1 March to 8 March 2014, with Wycombe Astronomy Society at Waddesdon Manor. 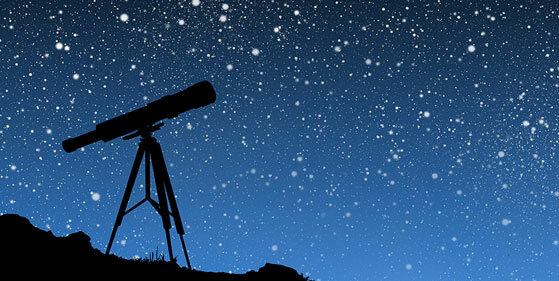 Join us on Saturday 1 March for an evening of stargazing within the beautiful historical grounds. The evening will start with a two course dinner in the Manor Restaurant, followed by a lecture from WAS member Sandy Giles. Afterwards depending on the weather you will be able to join an additional group of Wycombe Astronomical Society members out on the Parterre for stargazing through a variety of telescopes. Planned targets for the evening include Jupiter the biggest planet in our solar system, Castor, Alcor and Mizar, The Pleiades, The Orion Nebula and many more.